Continuing a 134-year family legacy of customer service and early adoption of emerging technologies. Tom Arehart, the founder and leader of The Tom Team, has been helping clients in the Washington DC achieve their real estate goals since 1994. A second-generation real estate professional and a seventh-generation Northern Virginian, Tom is a member of the Fannon family, an institution in the Alexandria business community for more than 130 years. Tom’s Great Grandfather, Thomas J. Fannon, founded T.J. Fannon & Sons on the corner of Duke and Henry Streets in 1885 with a business loan of $500 from a prominent local grocer. The business made it’s mark in the early days selling coal and wood to local residents. With the advent of trucks and other advancements in technology, the coal business rapidly expanded after the turn of the century. 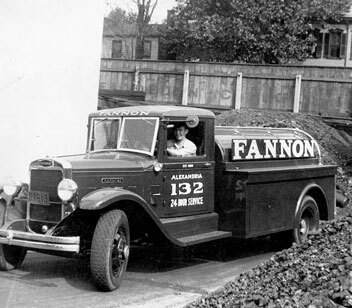 In the twenties, Fannon made its first oil delivery and was soon installing oil heating equipment, as well as natural gas appliances. As central air conditioning became popular in the sixties, Fannon led the way in sales and service. Being in touch customer needs and desires. The Tom Team continues the time-tested philosophies of Tom’s Great Grandfather in our real estate practice—treat people well, exceed client expectations for a fair price, and continually evaluate and embrace new technologies. These principles sound simple, but they often get lost in today’s fast-paced profit-driven business climate. And most of our team being life-long DC-area residents, assures you that we know the nuances and attributes of every neighborhood in the area. When considering your next real estate move, experience the commitment to service and value that continues to make The Tom Team one of the most successful real estate practices in the DC area. In fact, we’ve been listed in The “Best of Washingtonian” for the past 10 years, and counting!